Calvert Crossing Golf Club's scenic views, rolling hills, manicured fairways, and shimmering creeks provide the perfect backdrop for your wedding and special events. Our facility can accommodate groups a large as 300 guests, but it is also perfect for smaller more intimate gatherings. 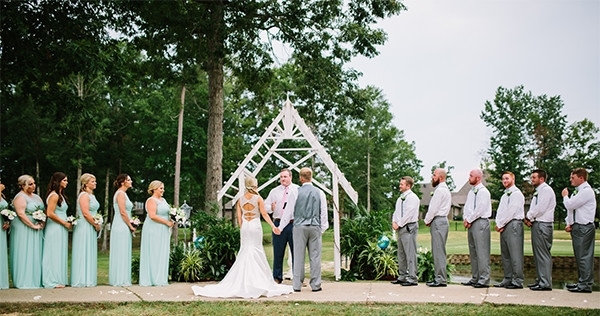 Along with the beautifully landscaped surroundings, we offer indoor and outdoor event space, numerous photo opportunities for your special day, and some the finest hospitality in Calhoun, Louisiana. Our team is ready to assist you in planning your event just as you have always imagined. They’ll help you select a menu that compliments your style and budget, assist with room selection and dining configurations, and make recommendations regarding the best vendors in and around West Monroe for flowers, wedding cakes, photography, music, and more.